Aww, yes, good old Microsoft. They never cease to amaze us. Oh my, what’s this? 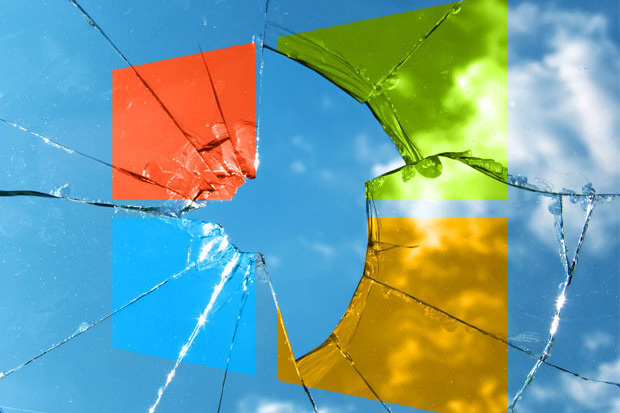 For those of you who haven’t already came across this, Microsoft is blocking Windows Updates on any Windows 7/8/8.1 PC that is running on the latest generation Intel Skylake/Kabylake and AMD Ryzen processors. 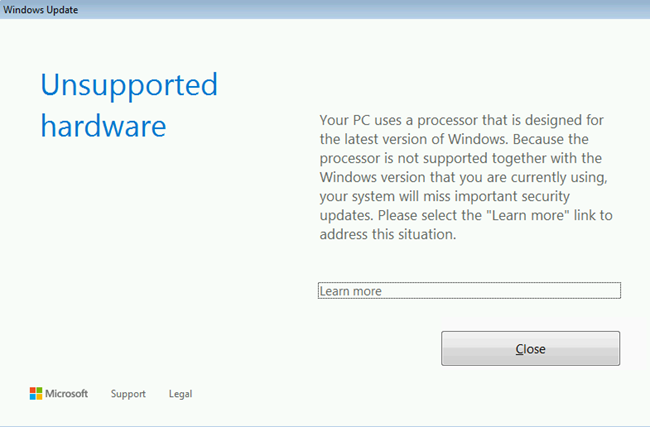 You may have noticed that when you try to check for new updates, you get an error message as well as a pop-up windows stating information about “Unsupported Hardware”. It doesn’t matter that Windows 7/8 are still fully in extended support for years to go, Microsoft doesn’t care. 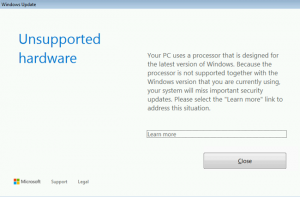 They want to force users to upgrade to or buy a new PC with Windows 10. It seems, despite many reviews and people complaining to the contrary, that they don’t know how horrible Windows 10 is for many businesses and even some consumers. Don’t get me wrong, it can work just fine depending on what you need it for and what kind of PC you have. Yet, for the most part, for overall usefulness and non-crappiness (and least amount of telemetry/spying), Windows 7 still trumps Windows 10. The amount of businesses and state/government entities that continue to require and use Windows 7 is very large so I don’t really understand this move by Microsoft. They have never done such a thing in the past before, so why piss off even more people now? Wait a minute, what am I saying?! Of course they would do this, just because they can. I think they are intentionally wanting everyone to switch over to Linux or (heaven forbid) an Apple device. Fortunately, there is a workaround for this problem in the form of an unofficial ‘patch’. It doesn’t actually directly patch any system files but it does trick Windows Update into believing that the CPU is not the latest which makes Windows Update work. I’ve tested it on a couple of systems and it works great. Thank you so much to the creators and supporters of this tool, you (among so many people out there) are a life saver! It’s easy to install and is set-it-and-forget-it, and most importantly, it’s free! The name of said tool is wufuc, I guess, and the download, as well as loads of information on what it does and how, can be found HERE. Unfortunately, Microsoft could ‘fix’ this patch at any time thus rendering it useless, but maybe not. Even so, the wonderful community out there would find another way around it I’m sure. So, for now, don’t fret if you can’t install updates and see the dreaded error message, hope is not lost. You can still continue to use Windows 7/8/8.1 for the foreseeable future, at least until extended support is over in 2020+.